There’s a better way to do it – find it. Have you read articles like this one that tell us about all of the jobs that may disappear in the next few years? Or, maybe you have been to a presentation where you’ve heard all about the skills we teach students that may be obsolete in the future. The consensus is that the only way to prepare for an unknown future is to develop student skills in problem-solving, critical thinking, and innovation. It is difficult to know how to prepare students for the unknown, but one way is certain – we must allow them time to explore, create, and innovate on their own. These explorations help develop essential skills such as critical thinking, working together in teams, and learning how to work through failures. In fact, students need to recognize that failure is an essential component of innovation and invention. The Classroom Connection Events Calendar provided by TeachersFirst is an ongoing collection of competitions and events for students and teachers. Many of the offerings on the calendar include contests encouraging innovation and outside of the box thinking. Some of the upcoming events are perfect for inspiring and motivating students toward innovative thinking. Rube Goldberg Contest (online contest deadline April 13, 2019) – perhaps you’ve seen some of the creative contraptions entered into this contest to perform simple tasks. If not, take a look at this compilation of some of the best machines on the internet. This year’s task is to build a machine to put money into a bank. Be sure to review information on the site to become familiar with all requirements. If you aren’t ready to enter but want to explore Rube Goldberg devices in your classroom, this lesson plan is perfect for beginners. For true beginners, this printable created by Rube Goldberg’s granddaughter introduces her grandfather’s inventions to a new audience. These lessons and activities correlate to Next Generation Science Standards. Rubber Band Contest (for grades 5-8, contest deadline March 8, 2019) – what can you do with rubber bands? The challenge of this contest is to design and create a working invention or artwork using at least one rubber band. This site also shares lesson plans correlated to Next Generation Science Standards, along with Common Core, National, and Ohio state standards. Carton 2 Garden (entries due March 25, 2019) – explore ways to repurpose milk and juice containers for your school garden to win prizes. The grand prize winner receives $5,000. Use the Judging Rubric from the site to guide the process in preparing for the contest that requires a video submission. Prizes are awarded in two categories – elementary and middle/high school. 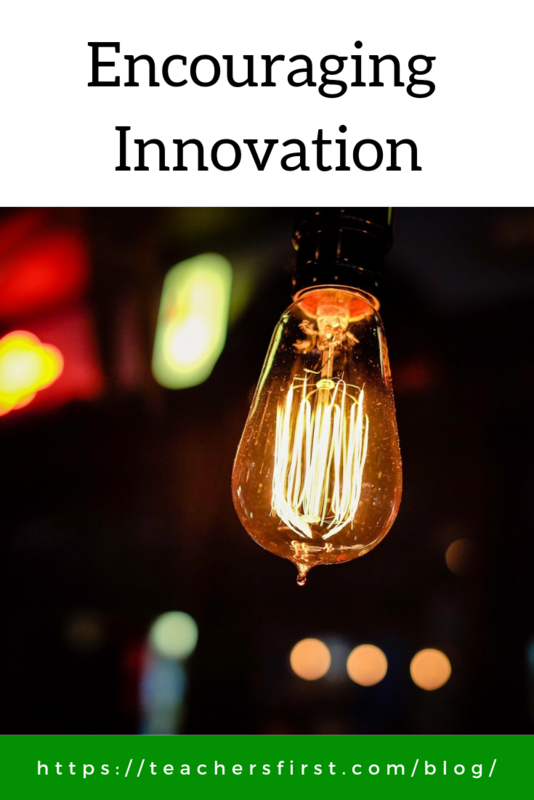 If you don’t want to explore contests and competitions, another way to encourage innovation is through the use of MakerSpaces in your classroom. Find ideas to get started on the TeachersFirst Special Topics Page devoted to MakerSpaces. This page includes over 30 MakerSpace resources including an archived Twitter Chat, lesson plan links, and online activities. There is plenty here for educators getting started with MakerSpaces and experienced MakerSpace enthusiasts. Introducing innovation and exploration into classrooms is as essential as teaching content. Our students must be ready to prepare for careers that are unknown to all of us, and the ability to innovate and problem solve is a crucial skill in adapting to whatever is ahead. Do you have a favorite innovation lesson, or perhaps tips for setting up a successful MakerSpace? Help your fellow educators by providing some ideas in the comments below. Next Next post: Teaching Geography in the Classroom – Maps, Maps, and More Maps!